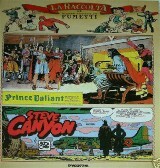 There was also one special book called "La grande avventura dei fumetti'. This magazine-like book is numbered 6. Together with other issues these magazines were forming a sort of catalogue. Issue 6 contains page 61-72 of this bigger catalogue. Inside many hero's are dicussed in articles. PV is one of them.